Recent studies have shown the potential benefit of indocyanine green fluorescence imaging (ICG-FI) in lowering the anastomotic leakage (AL) rates by changing the surgical plan. 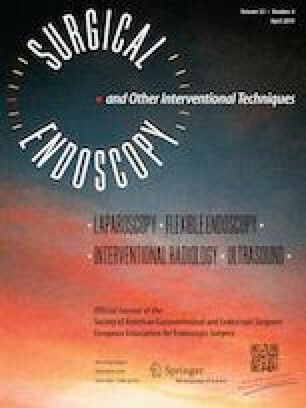 The aim of this study was to evaluate the effect of ICG-FI on the AL rates in laparoscopic low anterior resection (LAR) for rectal cancer. From September 2014 to December 2017, data from patients who underwent laparoscopic LAR for rectal cancer were collected and analyzed. The primary endpoint was the AL rate within 30 days after surgery. The incidence of AL in patients who underwent ICG (ICG-FI group) was compared with that in patients who did not undergo ICG (non-ICG-FI group) using propensity score matching. Data from 550 patients were collected from 3 institutions. A total of 211 patients were matched in both groups by the propensity score. ICG-FI shifted the point of the proximal colon transection line toward the oral side in 12 patients (5.7%). The AL rates of Clavien–Dindo (CD) grade ≥ II and ≥ III were 10.4% (22/211) and 9.5% (20/211) in the non-ICG-FI group and 4.7% (10/211) and 2.8% (6/211) in the ICG-FI group, respectively. ICG-FI significantly reduced the AL rate of CD grade ≥ II and ≥ III (odds ratio (OR) 0.427; 95% confidence interval (CI) 0.197–0.926; p = 0.042 and OR 0.280; CI 0.110–0.711; p = 0.007, respectively). The rate of reoperation was significantly lower (OR 0.192; CI 0.042–0.889; p = 0.036) and the postoperative hospital stay significantly shorter (mean difference 2.62 days; CI 0.96–4.28; p = 0.002) in the ICG-FI group than in the non-ICG-FI group. ICG-FI was associated with significantly lower odds of AL in laparoscopic LAR for rectal cancer. The study was registered with the Japanese Clinical Trials Registry as UMIN000032654. Jun Watanabe, Atsushi Ishibe, Yusuke Suwa, Hirokazu Suwa, Mitsuyoshi Ota, Chikara Kunisaki, and Itaru Endo have no conflicts of interest or financial ties to disclose.